Rose Cottage is a tranquil little cottage which boasts a small enclosed garden for a peaceful and secure holiday. An ideal get a way for those wanting privacy or those with children or pets and want the peace of mind that they are somewhere safely enclosed. There is a downstairs bedroom and shower room which means that those with limited mobility would also be able to enjoy a pleasant stay. without having to worry about the stairs. We live in the village so are available as much or as little you need. I am a retired teacher who now lives in the village of Moussac. I live with my wife and grown up daughter and our dogs. I enjoy the outdoor life that Moussac allows me to have. I enjoy gardening and fishing and enjoying the beautiful river views. As a family we are avid readers and enjoy exploring the history of the area. We love the region because of the beautiful landscapes. The good weather and excellent access to airports. It affords us a lifestyle that would be simply impossible anywhere else. The property is around one hour from two airports. There are good train routes from Poitiers into nearby Lussac (around 10 minutes drive) for those who do not want to be tied to the car. Futuroscope is around an hour away. The property is one two levels, with a downstairs shower room and bedroom. This makes it an excellent place to stay for those with mobility issues. The enclosed garden is wonderful. Our dogs are members of our family...but they like to escape! we have tried and tested our garden and so far so good! En-suite toilet to bedroom 1. Shower room with shower, wc and toilet. Parking is on road right in front of cottage. Off road parking provided 1 minute walk away. 5 minute walk to hire canoes. Tennis courts available to hire in the village. Outside: Enclosed private garden. Patio. Barbecue. Outdoor table and chairs for outdoor dining. Parasol. Cleaning / Towels / Linen / Maid service: Linen and towels included. Please bring own towels for use at river/canoeing. Other: Family room with comfortable chairs, coffee table, jigsaws, books. Enclosed garden with BBQ and garden furniture and parasol. excellent facilities in the cottage, kitchen very well equipped, with all you need on a holiday. Owners were very helpful with some good input. Nice position on a lovely quiet village. 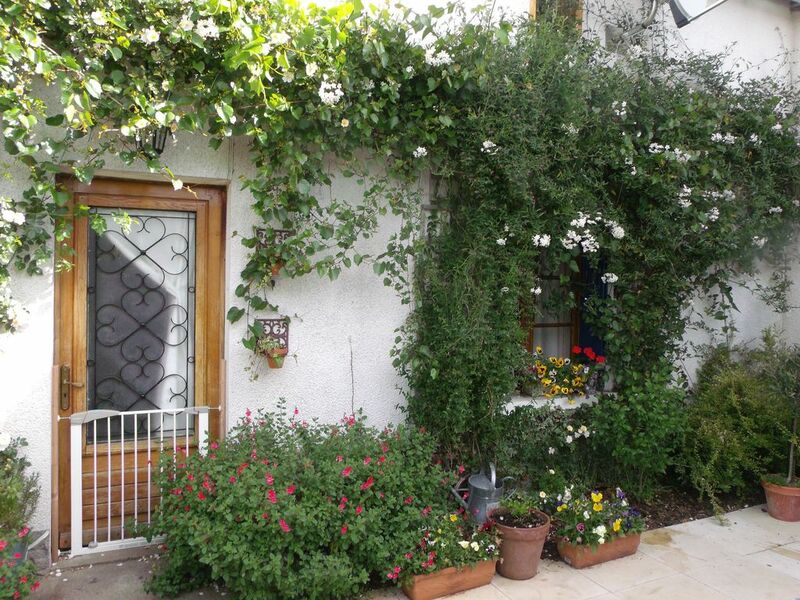 Nice large kitchen, well equipped Gite. Firstly, we were welcomed by Dave into lovely Moussac which is a photographers dream with picture postcard settings of a little rural town at every turn. Its a great place for dog walking along the river up the railway path or pretty much in any direction you turn. Dave gave us loads of ideas for routes to explore with the hound and we had a great time doing it. I just realised i havent got to the cottage yet... so, Rose Cottage.. it is a gem of a place and totally blew our expectations out of the water. It is a lovely wee house on the outside.. and so ewhat of a tardis on the inside. The house is brilliantly equipped with everything we needed and more. We spent the bulk of out time in the large kitchen area which was the hub of operations. Off of it there is a sitting room with a full array of british tv. Upstairs is where the real magic is tho.. it is just the last type of bedroom we expected i a really really good way. Overall, a superb cottage owned by a lovely welcoming family who live 2 minutes away. Next door is the local shop/bar/breadstick maker... the nearest intermarche is 10 mins away L'isle- Jourdain.. be sure to check out the thursday market and take the time to walk over the viaduct which has a parcour course next to it. Overall, a glowing review which is very well deserved, thanks again Team Grundy for having us. Really lovely house, fully equipped and super cosy!! Village is quiet with plenty of walks and amazing river with nice park and pool. Owners are very pleasant local english family who are there if u need them but leave u to it if not. Wonderful stay and will rebook in a heartbeat. Poitiers airport approx one hour drive. Limoges airport approx one hour and fifteen minute drive. Village restaurant/bar is a 1 minute walk. Nearest supermarket is a 10 minute drive. Canoe centre is a 5 minute walk. Booking Notes: Deposit of £100 to be paid at time of booking. Balance to be paid 6 weeks before arrival. A damage deposit of £100 is to be paid on arrival. This will be returned after the property has been checked minus any damages. Bank transfer. Changeover Day: Change over day is Saturday. Arrival after 3pm. Departure before 10am.